It was mid-afternoon on a hot sunny summer day, an occasional gust of wind would ruffle the surface of the water, and stir the streamside vegetation. Sitting in the shade of a cottonwood tree, after I consumed my lunch, I was contemplating a little afternoon siesta when I began to notice an occasional rising trout. During the cooler hours of the morning a sparse hatch of Pale Morning Duns had provided some action, but that hatch had ceased when the temperature began to rise. I had planned to rest in the shade until the sun dropped behind the nearby mountain hoping that a spinner fall might take place in the cool of the evening. As I looked upstream, through the glare of the sun, I could see several sporadically rising trout, and although I could not see anything on the water the fish continued to rise. As I continued to watch the action I began to notice a distinct pattern. Each time the wind would blow, within a few minutes, the fish would start rising. During the periods when the wind was still, the number of rising fish decreased, and suddenly I believed that I had the key to the mystery. Selecting a fly from my fly box I slipped into the water and moved up to casting position below the nearest rising trout. I waited until a gust of wind swept the streamside vegetation, and then I dropped my fly a few inches above where I had last seen the trout rise. My imitation only floated a short distance before it disappeared in an almost imperceptible rise. I raised the rod tip and a fat golden brown trout cart wheeled out of the water, and after several more jumps and spirited runs slid over the rim of my landing net. Snug in the corner of his mouth was my imitation, a black foam beetle. My conclusions had been correct. After I released this fish I repeated the performance on the next riser, and this continued for the remainder of the afternoon. All of the trout were waiting for the wind to shake the terrestrials from the vegetation and into the stream. Then it was a very leisurely affair to simply tip up and sip in a tasty snack. When the sun finally slipped behind the mountain I decided not to wait for the possible spinner fall. The afternoon of fishing with beetles had temporarily satiated my desire to fool any more trout. Over the years this scenario has been repeated many times during the hot days of summer. Ant, beetles, bees, hoppers, and an assortment of other creepy crawlers make up a substantial portion of the trout's diet during the warmer months of the year. This is especially true during periods of hot weather when aquatic hatches are limited or of short duration. These non-aquatic insects, often referred to as terrestrials, are far more common than most aquatic insects, and trout seem to be very aware of this food source. I believe that these insects become even more important during periods of drought. During dry periods the only green vegetation is along the edges of permanent streams and other bodies of water. Terrestrial insects are attracted to the vegetation as a source of food and shelter, and may even become concentrated in this vegetation during periods when their normal habitat may have become unavailable due to drought. This is especially true of beetles, bees and grasshoppers. Even ant numbers may be enhanced along streams during periods of drought because of the concentration of insect prey. Numerous theories have been advanced to explain why trout feed so readily on terrestrial insects. Some people have suggested that these insects offer a change of pace and even a change of taste. Ants have a particularly acrid taste due to their chemical defense system, and perhaps the trout find this appealing. However, whenever I have recovered insects from a trout's stomach they have always been whole. Trout do not chew small insects, they simply swallow them whole. It is possible to recover recently ingested insects that are still alive so I believe that taste is an unlikely criterion. Rather, I believe that trout eat terrestrial insects for the same reason that they seem to relish mayfly spinners, they are easy to eat. Unlike aquatic insects that are hatching, and flying away from the water surface terrestrial insects are generally trapped in the surface film. They are at the mercy of the currents, and most will never successfully leave the watery medium. Trout may feed at leisure without expending a great deal of energy to capture their intended prey. Watching trout feed on terrestrial insects, especially on slow flowing streams, is like watching guests at a reception where finger food is being served. Like guests picking through the meat and cheese trays trout feed on terrestrials in a laid-back fashion, tipping up to sample a beetle, then an ant, and possibly a bee or perhaps a grasshopper. Depending on their mood, each trout may respond differently to terrestrials. Some trout will hold in a given spot and only eat the insects that come directly over them, while others roam around picking up an insect here and another one over there. Some trout patrol a certain area swimming upstream eating whatever strikes their fancy, and then drifting back downstream and then turning back upstream to repeat the process. Sometimes this pattern is so repetitive that the trout seems to be on a preset track going upstream to a certain point and then turning back down to the starting point. I prefer the trout that hold in a given location because they are much more predictable. Trout feeding on terrestrials are generally less selective than they might be when feeding on a specific hatch. Usually terrestrials are a mixed lot with an occasional ant, some beetles, a stray bee, a leafhopper, or grasshopper or even a housefly rounding out the smorgasbord. Occasionally one type of insect may dominate, and then the trout may become selective. This happens with grasshoppers, and occasionally with ants. 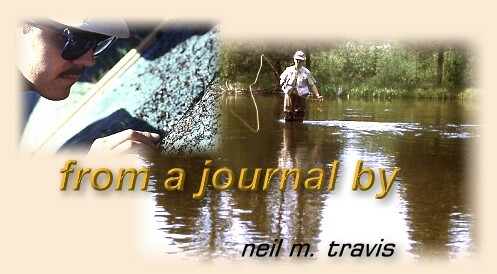 It was in early September that I encountered one of my most difficult terrestrial fishing challenges involving ants. The name and location of the stream shall remain my secret, but on this particular day a warm late summer sun was shining, and I was hoping to raise a few trout on hoppers along a meandering stretch of this stream that flowed though a heavily grassed meadow. There was a slight breeze blowing, and I knew the grass was heavily populated with hoppers. The warm sun made them active, and I was hoping that some of them would end up in the water. The stream was low and as transparent as mountain air after a rain. Along the banks in the deeper pools I could see an occasional dimple of a rising trout, but the rise forms were not like trout feeding on hoppers. I squinted at the surface, and at first I could not see anything float on or in the film. I tried a number of various terrestrials but nothing moved the trout. They continued to feed, sometimes rising within inches of my fly. Finally in despair I waded right into a spot where one fish had been steadily rising, and stood staring at the surface of the water. Then I saw a tiny insect struggling in the surface film. I quickly dipped it out with my net, and there was the smallest flying ant that I had ever seen. Nothing in my fly box, which contained some size 28 flies, could even come close to matching this miniscule insect. As I watched the water I saw more and more of these tiny ants floating down in the flow. This was truly the unmatchable hatch, and despite my best efforts to tempt them into rising to some other fly it was to no avail.